The theory of Six Degrees of Separation supposes that everyone is six or fewer steps away from any other person in the world. In the motorcycle industry, it is fair to say the same is true of every model ever made by every manufacture to ever exist; but which motorcycle is separated by the least steps? Which one sits right smack-bang in the centre? 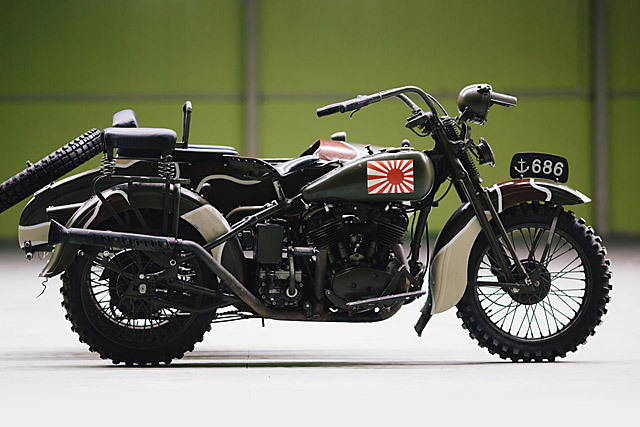 Surprisingly, the Answer is the Rikuo Type 97; an American-powered bike produced in Japan by a conglomerate of many small companies that would later become the automotive kings of Asia. And all as a result of protectionist policies designed to assist British Manufacturers with technology passed to German and Italian companies through the War Alliances of the time. 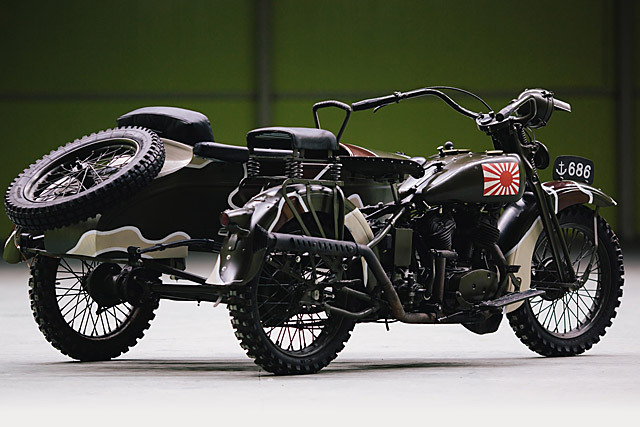 It is no wonder, then, that this 1938 Type 97 belongs to our bike-and-battle-obsessed friends at the Motos of War collection in Russia known as The Motorworld by V.Sheyanov. 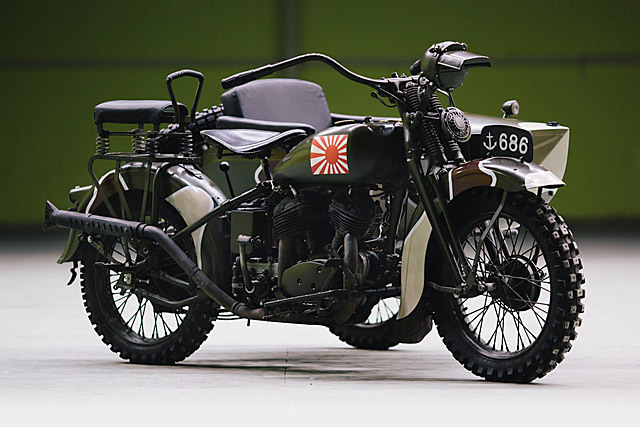 For all the incredible stories that make up the history of the world’s motorcycles, perhaps no other can rival that of the Type 97. 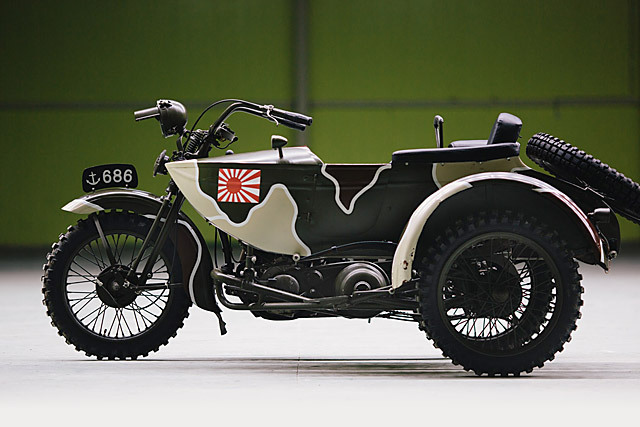 In the 1920s the UK introduced tariffs to protect its industries including its motorcycle manufacturers and at the same time the increasingly militarised government of Japan was subsidising its own motorcycle industry to protect its domestic producers. This took a huge toll on Harley-Davidson’s export sales and by the time the Great Depression hit in 1929 the Milwaukee company was on the verge of bankruptcy. Through a series of complex events the Imperial Japanese Army, fast becoming the defacto Government of Japan, acquired a license to reproduce the HD Flathead engine in Japan under license. Given the IJA had already invaded Manchuria, the license should never have been granted under US law. 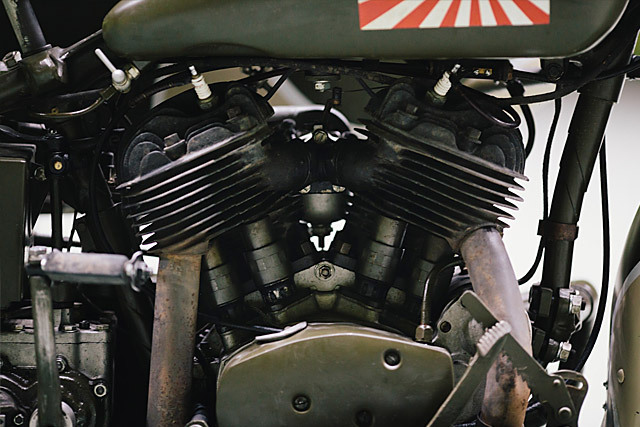 But the IJA hid their involvement behind a company called Sankyo, who not only acquired the license but had an entire Harley engine factory transported to Japan from the US. Production of both the Flathead V-Twin engine began immediately and by the time the engine was being pieced together for this particular bike in 1938 the design might have been Milwaukee owned, but the components were all being made in Japan and the task of construction was given by the IJA to companies scattered around the country including some that would become household motorcycle names and one that would later become Mazda. Having refused to buy a license for the new Knucklehead design the Japanese companies had become masters of the Flathead and it was renowned for its reliability. With high-compression the engine produced a healthy 28hp at just 4000rpm with more than enough torque to power the sidecar-motorcycle combination. Part of this torque came from the increased capacity to nearly 1300cc over the 1200cc American version of the VL design. Although Harley-Davidson was developing its engine in a similar vein, on each side of the Pacific the path to increased performance and reliability were very different. By 1938 HD had been producing their VLH engine for two years with 80 cubic inches, while Rikuo’s were 77ci but somehow the Japanese were producing more torque, the secret to which was a state guarded secret. That extra torque became vital considering the drivetrain loss that is associated with powering an extra wheel as the Type 97 does with both the rear wheel and that of the sidecar being driven. To achieve this, a wet multi-plate clutch works in conjunction with a three speed gearbox to send drive to the rear wheel. From here a coupled driveshaft sends power directly across the rear of the side car to its wheel hub. 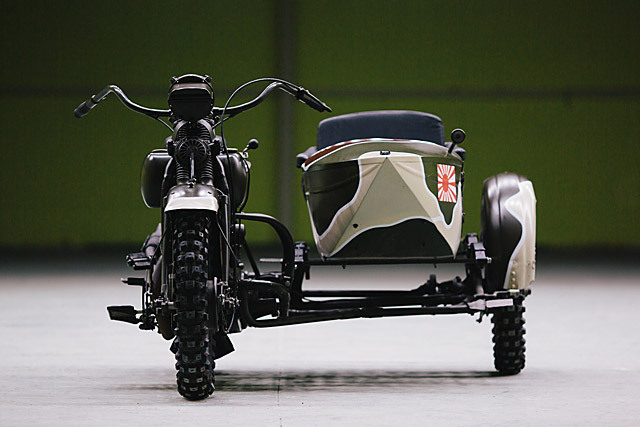 This was an early addition to the sidecar equipped Rikuo’s as Japan’s invasion China and particularly in Manchuria required a military vehicle capable of performing in adverse conditions caused by war, lack of infrastructure and the sheer muddy nature of its operating environment. 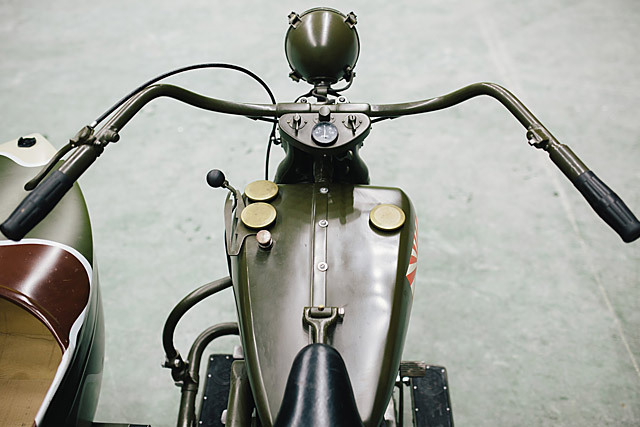 Aiding in this endeavor was the significant amount of ground clearance of both the motorcycle and sidecar, with the drive components all elevated in the design to avoid bogging and striking debris. Capable of transporting three fully equipped soldiers, the Type 97 was still known for its remarkable maneuverability. 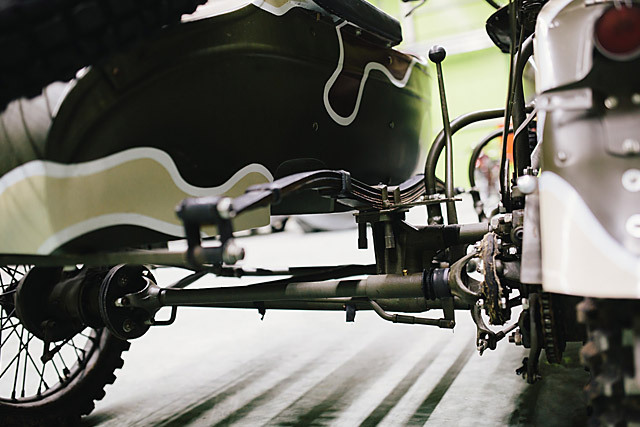 The Japanese spent considerable development on the suspension to achieve this remarkable feet and it starts with the rigid frame that was assembled and welded in such a way that it would flex to deflect the impact of large rocks or rough ground. The front suspension too was precise and sturdy for the time, consisting of a friction dampener and varying length pendulum style forks to dissipate energy. 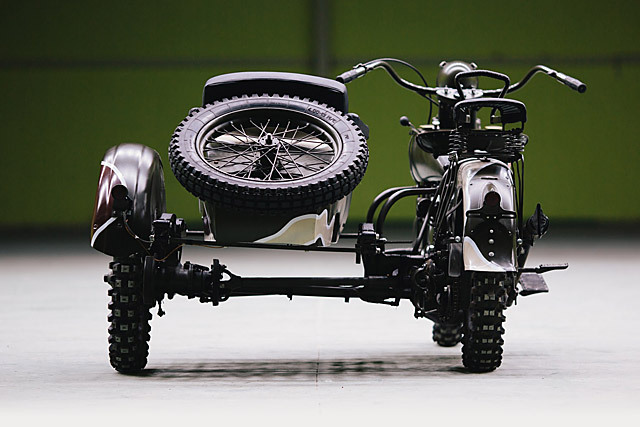 The rigid rear meant that there was less stress on the driveshaft for the sidecar but a relatively soft leaf spring arrangement allowed the weight of the total vehicle to shift rearward under increased acceleration providing additional grip when traction was lost. Assisting that level of grip came from deliberately narrow wheels carrying heavily knobbed tyres that not only dispersed water and mud but ensured the maximum amount of weight was applied to each square inch of tyre making contact with the ground. The body work is also a key clue to the intended use of the machine, huge mud stopping fenders were fitted front and rear and the aerodynamic side car was mounted high above its own frame rather than sitting in a cradle. The fit and finish are what you would expect from a Japanese vehicle with minimal controls and instruments designed to cope with adverse climatic conditions. While the rider and passengers sat on well-appointed hard-wearing leather-bound seats extra options were minimal as the weight of such a vehicle ballooned. That weight was considerable, 500kg and stopping it in such conditions meant that the sidecar had its own drum brake to assist. But given that Japan had largely only built small capacity engines for their motorcycle industry it was the clever acquisition of the Harley-Davidson engine design that made powering such a machine possible. The fact that a major US company had effectively given superior technology at a bargain price to a country that would very soon be the enemy following the bombing of Pearl Harbor is a major reason why information about the Type 97 is so scarce. 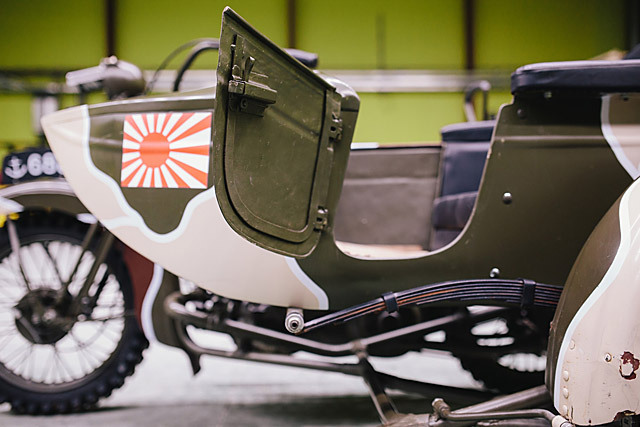 Although it is believed some eighteen thousand vehicles were produced, largely for the IJA, very few survive today. Many examples used in China, Mainland Japan and Manchuria were destroyed, a face-saving exercise for both sides and although Rikuo survived the war and produced V-Twins of a smaller capacity by the early ’60s the company had ceased to exist. But one final twist would bring this whole story full circle and show just how intrinsically linked the Type 97 is to so many motorcycles that we even ride today. 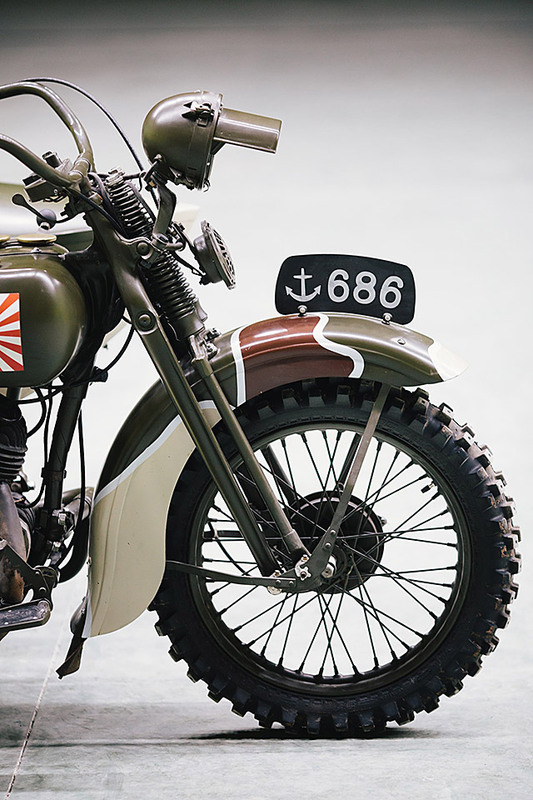 Revealed years later, the Rikuo brand originally established by the Sankyo company, who had acted on behalf of the IJA to dupe Harley-Davidson and US law makers was sold in 1949, including all their parts, plans and designs, to a company still known today, Showa. A leading suspension component manufacturer who not only supplies the likes of Honda, Ducati and Kawasaki, but to Harley-Davidson themselves. It is truly one of the greatest stories never fully told and you can not only sit on this piece of motorcycle history but take it for a ride too. Simply contact The Motorworld by V.Sheyanov to find out how and twist the throttle on a machine that packs more motorcycle DNA in its core than any other. Tell them we sent you.